Why the Aardvark Has a Long Tongue. This one is starting to look a bit glassy-eyed and might pass out soon. Which is good, otherwise he wouldn’t leave any for the next guy! This illustration was created for the “Drunk” topic at Monday Artday. Hooray for sticking with one color family! I did do a bit of extra correction in paint.NET, particularly closing the mouth partly and cleaning up a few messy spots. Most of the ink was done with a teeny 0.05 Copic multiliner, though I did go back at the very end and thicken some lines with a 0.2. Apparently I am on a bit of a kick with long-snouted creatures. This will come as no surprise to those folks who visited during my “big nose” phase which, now that I think of it, may not have been a phase at all. Reference aardvark photo from ARKive. Reference dandelion photo from Paul Franklin. 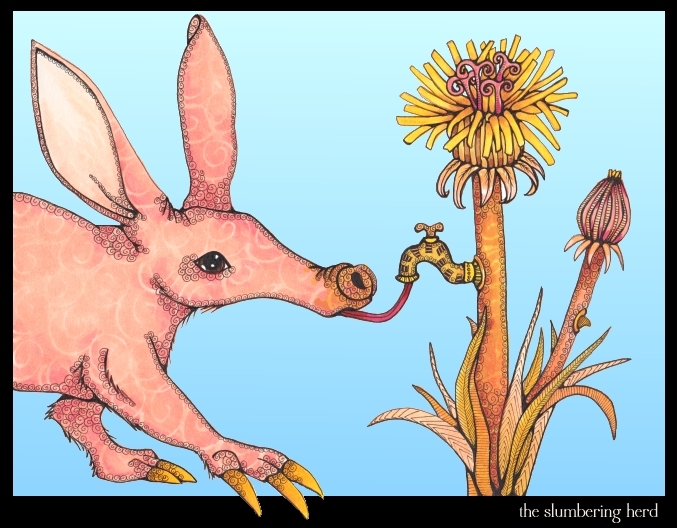 This entry was posted in Copic Markers, Progression Photos, sketches, Unusual Animals and tagged aardvark, beasts, Copic Markers, liquid frisket, monday artday, pen & ink on May 17, 2012 by The Beast Tender. Hi Cindy, after you left a comment on my blog I went and had a look at your work and I just LOVE what you do! There isn’t one that doesn’t make me smile. Well done, I’m certainly going to come back often. I now need to find out what “Copics” are – we don’t have those here in South Africa – not to my knowledge anyway. He’s wonderful! He looks so aardvarkian! Also love your detailed flower, and the funky little spigot. As soon as I saw this pop up on my screen I fell in love. I love the way your mind works! Great illo! I love the way your brain works, Cindy! Isn’t it fun how a story can develop in your head as you draw or paint. I imagine you get to know each critter very well, because your stories are so creative. I love this!! That sweet little face makes me go aaaaaawwww! Love this, Cindy!!! Especially the detail in the dandelion! Also the subtle pattern on the aardvark. Nice balance in this one!! So creative! Thanks guys, what nice comments! Absolutely amazing and ingenious! You are just the best, Cindy. Seriously: publish! This guy is adorable yet is certainly an aardvark. Love his claws breaking the border, and of course, your living patterns! Nice composition and color balance and, as ever, your wonderful use of pattern! As for the critter himself–I hope he doesn’t get this tongue stuck ;) (Btw, I like the “hic” and the bubbles in the prelim. sketch). Nice job on those petals! I absolutely hate drawing dandelions. I tried it once or twice and gave up each time. You managed to pull it off and made it seem like a piece of cake. And all that in the lovely Cindy-style! I like the stripy tap too. I have to ask, is that sketch scanned in? Don’t you wish there was a scanner designed specifically for pencil artists -so it wouldn’t pick up every grain of the paper texture along with the pencil lines? That would save me a lot of time. Yep every one scanned in on my handy dandy but too small(8.5×11) CanoScan LiDE 700F. But I think I need to clean the glass. Also, in setting scanner to catch even the lightest pencil lines, it definitely picks up more background junk. But then with the color scans I usually dial it back so the color isn’t affected. Hehehe. I enjoyed that. The illustration looks gerat. I have never used copic markers. Wow, it looks so crisp. Beautiful, I love how you mixed your imagination with the real facts of nature. Cindy, this is my very favourite of your new works! You nailed it. The colours are out of this world. The aard varrk oh I can’t spell it and the dandelion are so beautifully drawn. Damn you’re good. When will you do a book? Ardvarks are one of my favorite animals! Love this! I like your stylized dandelions too. Not only do we have your wonderful illustrations to look at but your fantastical stories to read too. This made me smile – A LOT! Adorable illustration and a very charming story! I really like your style! This is great picture! I like it!! !